Road trip! This weekend we were out of town, but we still made time to try a new pizza place. This time it was G & D Pizzaria in Columbia, Missouri. G & D is more than just a pizza place. In fact, they are actually a Greek restaurant that does steaks, sandwiches, gyros and a lot more. Walking inside the rather large restaurant, we were greeted with a “Hello, friend!” from one of the owners standing behind the counter of the open kitchen. The busy kitchen features a well used Baker’s Pride deck oven and a pizza sheeter turning out really thin pizzas. We were shown to a booth immediately and were surprised at how busy the place was for 11:30 a.m. on a Friday. It was packed. We quickly decided on garlic cheese bread, a 7″ pizza with pepperoni and sausage and a grilled chicken breast sandwich. Wait. What? Yes, the Pizza Wife didn’t want pizza today. Along with our food, the Pizza Wife ordered a soft drink. Much to her delight (hand clapping did ensue), they have crushed ice. 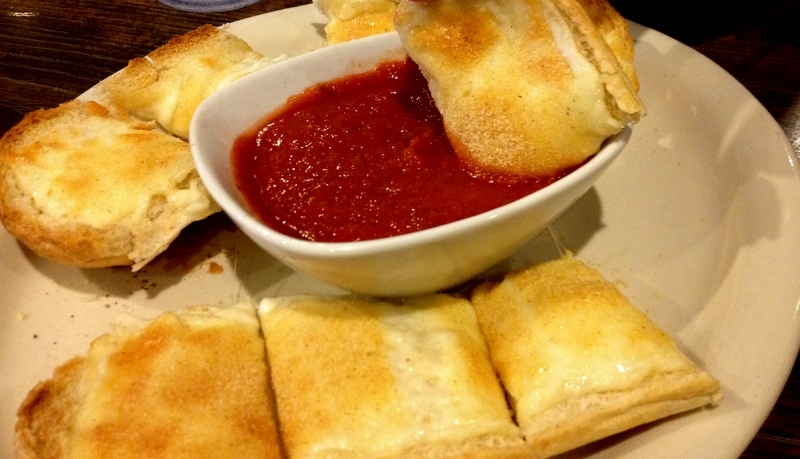 Our garlic cheese bread arrived quickly and was served with plenty of marinara for dipping. The bread was just hot dog buns that are covered in cheese and garlic powder, but they were surprisingly good. The marinara sauce was very flavorful and had a deep, almost smokey note to it. Unusual and tasty. 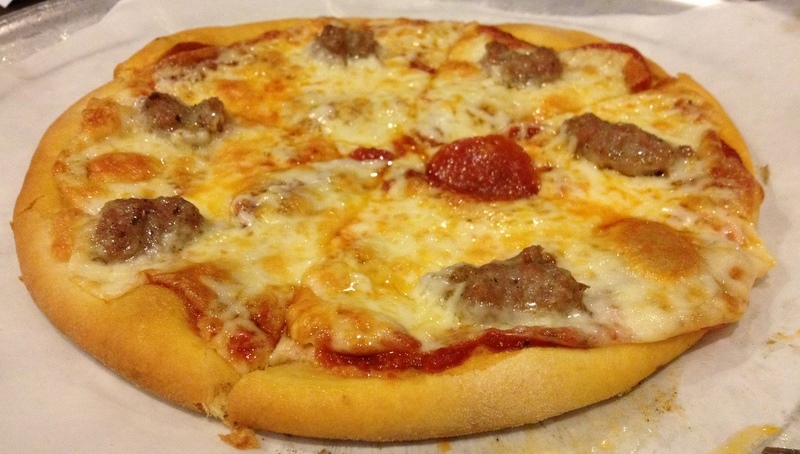 The 7″ pepperoni and sausage pizza was served on the standard metal pizza tray. Just like a supermodel, the crust here is impossibly thin and flaky. It measured right about 1/8″ thick, but was firm enough to hold the loads of pepperoni and cheese. Around the outside of the pizza they fold the crust under its self to form a thicker edge. A really good idea if you’re making pizza this thin. The sausage at G & D is absolutely fantastic. Very flavorful with just the right amount of spice. Very large hunks of spicy sausage found its way onto my pizza. The pepperoni is placed under the cheese here. At G & D they use slices of cheese instead of shredded cheese. I’m not certain if it makes a difference in taste, but it’s worth noting. I do know that this was definitely a tasty pizza. While I’d prefer a bit thicker and chewier crust, this was still a great pit stop on our road trip. The Bad: Crust that’s just a little too thin for our taste. How would you rate G & D Pizzaria? Click on the stars below! This entry was posted in Pizza and tagged G & D Pizzaria. Bookmark the permalink.